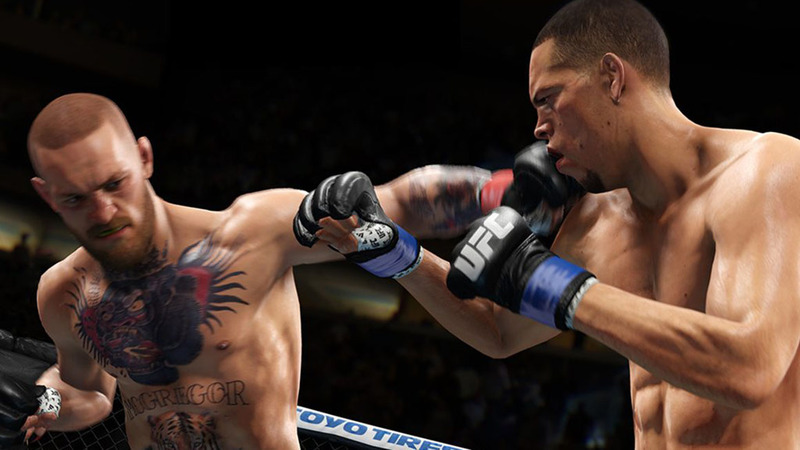 There are some subtle but notable improvements to the third installment of EA's UFC series. The presentation is fantastic and the gameplay is better than prior installments, but there is still plenty of room for improvement before this game can hit that top league of EA's very best sporting titles. Opinions on whether or not the UFC is really a sport or just needlessly violent human combat have long been mixed, but I fall into the former camp. 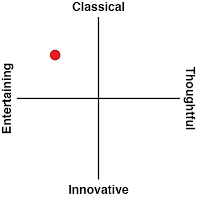 I've studied different forms of martial arts, I spent time learning how to box and while these competitions are undoubtedly violent, there is is considerable skill, dedication and strategy that go into combat sports. So with those considerations in mind, I can appreciate that this release is more technical and more realistic than ever. One of the first things I noticed when playing was that my stand-up style of combat worked better than ever. 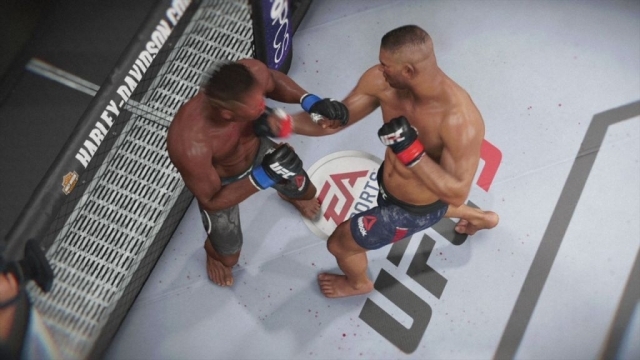 I have played the Fight Night titles in the past, and there are some similarities in UFC 3. The right stick allows you to bob and move your head to try and stay off of the center line where you are more likely to get popped. You have to manage stamina throughout the fight, a valuable resource that is really easy to run out of. Blocking also has its uses, but you can't just turtle up and block everything that comes in. Eventually your blocking will get spent and blows will start to slip through and connect, even if not at full power. 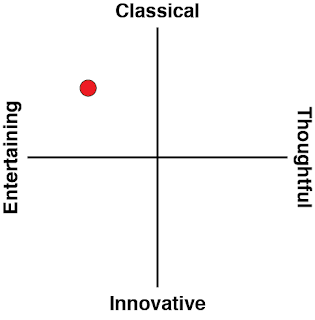 There is a lot of nuance here in the standing game, and I enjoyed it more often than not. Feel free to try and bring the big hits and win right off of the bat, but there is a very good chance you will just burn stamina and if your opponent weathers the storm, you won't have enough juice left to effectively finish the fight. Stamina works on two levels, with a full bar that allows you to throw punches and clinch and grapple on the ground. However, as you use stamina, the top end of that bar starts to decrease. What might be a full bar after thirty seconds in the first round could be a quarter of a maximum bar by the time the third round rolls in. This kind of resource management really forced me to consider the fight more strategically than I might have otherwise. I love going in with wild overhand punches and slipping in vicious uppercuts as much as the next person, but found myself often struggling to finish out the match - especially on higher levels of difficulty. Instead I had to learn how to throw a few jabs, slip in for a quick hook and uppercut combinations while biding my time for some bigger hits. Damage accrues throughout the fight to head, body and leg regions, and a series of quicker, lighter stingers might not seem very scary, but their collective toll could be the key to winning or losing a match. Balancing offence against defence is key, and your opponent has all of the same tools available as you do as you try to take them down. The biggest problem with the gameplay is when there is an actual takedown. The ground game has long been my bane in the UFC titles, and it still seems off here. It can feel sluggish and unfair, even if you know the mechanics well and have a character with strong stats in that area. I do not have the perfect answer here, as anyone who watches mixed martial arts with any degree of regularity can attest, there is a lot that can go on when two opponents are fighting on the mat. There are a variety of different holds, positions and moves that play into the battle. Maybe you want to try and slip your opponent into a submission hold like an armbar to force them to tap out - that is certainly an option. However, I generally found myself just trying to gain upright posture position from top mount and flailing away with my fists to force a knockout. It is effective and it keeps me from having to try and juggle two sticks and worrying about which quicktime menu option is going to pop up next (which is only further complicated by adding the L2 trigger to the mess when your character has unlocked special skills). Thankfully there is an option to go with a simple input system that cuts down the unneeded complexity, but still manages to come along as underwhelming. Simply put, EA Sports UFC 3 is more fun when the combatants are standing than wrestling. There are several modes here, from the usual quick play and online matches to a fairly robust career mode, which is where I spent the vast majority of my time. The ultimate goal is to meet a variety of career objectives in an effort to become the Greatest Of All Time (G.O.A.T.). This is handled in a few ways, from number of UFC matches to fight of the night awards and lifetime earnings. This objective combined with a pretty entertaining progression system serve as the primary hooks for coming back fight after fight. There are a variety of gyms that provide different areas of focus for your character. Early on in my career I had a limited purse and had to figure out what fighting style I was going to focus on (spoiler alert: striking. Always striking), and then start working out at that gym with my character. Starting off as a low ranking nobody in the World Fighting Alliance, winning matches earns you more money, which then allows you access to better gyms. Between fights you use your time at the gyms to hype your fight on social media (allowing your popularity and money earning potential to go up), take on challenges set against specific opponents (such as landing X number of punches without having Y number of misses in Z amount of time) that can unlock new moves and perks. Lastly you have training sessions that boost your overall stats. The career mode works. I got matched up a bit unfairly a few times along the way and really had to work for my wins, but I greatly appreciated the option to restart my match if I did not care for the end result along the way. This combined with a really nice presentation (the visuals and audio are really solid and there are some nice cut scenes spliced in that help illustrate your character's progression along the way) that kept this offering fresher feeling than in years past. My largest quibbles outside of the ground game is that the Ultimate Team mode (found in every other EA sports game it seems) is EA's attempt at microtransactioning a AAA title. The idea is interesting in that you have base fighters and can apply perks and moves to them for in-ring bonuses. The execution is a bit uneven though, and while I actually enjoy these combination sports card / fantasy sports modes in other games like Madden, I was somewhat ambivalent towards it here. It was okay, but by no means a major place where I spent a lot of my time. Additionally the roster of pre-existing characters left me with a sort of 'meh' feeling, for lack of a better way to phrase it. There are some very worthy inclusions, but this is one of those rare games where licensing doesn't work to EA's favour. By and large EA Sports UFC 3 is the best offering from the series yet. The standing combat is well nuanced, and most of the choices made for career mode felt like steps in the right direction. 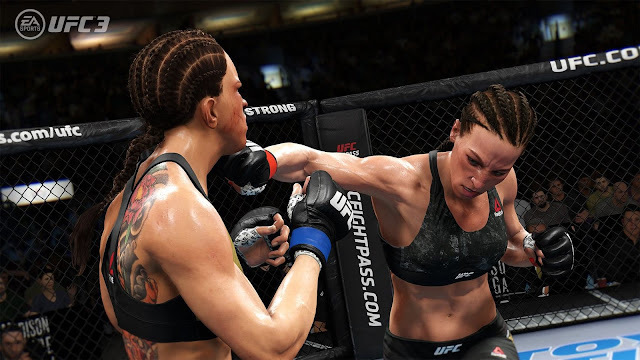 Ultimate Team feels a bit out of place and unnecessary, and the overall lack of roster inclusions and modes makes this a slightly more shallow offering, but the key is the combat... which words far better when a fighter is on their feet and not down on the mat. 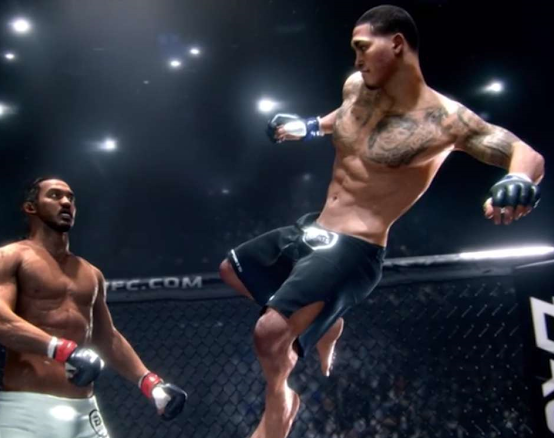 I was engaged for several days, spending plenty of time playing the game, but the reasons that most people continue to play an EA Sports title until the next iteration comes along just isn't as strong in EA Sports UFC 3.